Fish is one of the most highly perishable commodities and the public requires continuous reassurance about its quality. Futhermore, consumer taste is moving to more highly perishable fish products, which require more careful attention in preparation and storage. The fourth edition of Control of Fish Quality, which is truly international in scope, provides sound and practical advice on all aspects of this subject, from harvesting to retailing. The new fourth edition is a comprehensive revision that takes full account of all new findings and ideas to emerge in the five years since publication of the last edition. Numerous detailed ammendments have been made and this edition includes some entirely new sections. 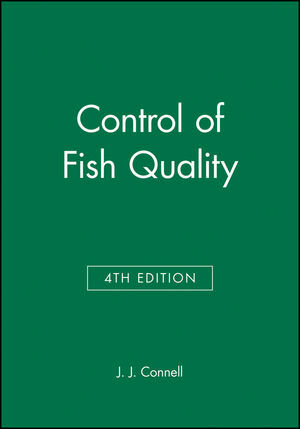 J. J. Connell is the author of Control of Fish Quality, 4th Edition, published by Wiley. 3. Quality Deterioration an Extrinsic Quality Defects in Raw Material. 4. Quality Deterioration and efects in Products. 6. Microbiology of Products and Further Aspects of Quality. 7. Methods of Asessing and Selecting for Quality. 8. Organisation for Quality Assusrance and Official Inspection. Suggested further reading and reference.